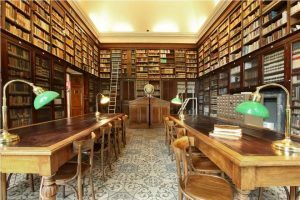 The library keeps Italy’s most important geographic literature collection, one of the most important in Europe. Over 400,000 books discuss topics in geography and related subjects. The “Fondo Antico” contains several thousends of rare books, from the 16th to the 19th century; ancient books, old prints and many important manuscripts with travel accounts. A specific section of the library is devoted to magazines and periodical publications; it includes about 2,000 titles, 500 of them are current and 2/3rd of the total are international. A relevant collection, from a scientific point of view, is the section including ancient and modern atlases. The library has a 2-section paper based catalogue, and a computer-based catalog. The first section of the paper catalog lists books acquired from the origins of the Society until 1979, classified by author. The second section includes books from 1980 to 1992 classifying by author and by subject. 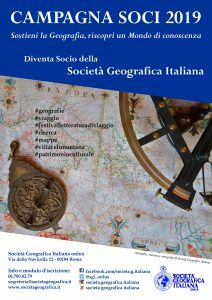 The computer-based catalogue covers publications from 1993 to present day within the Servizio Bibliotecario Nazionale (SBN) part of the Istituti Culturali di Roma (IEI). The library offers services of bibliographic research, documentation and reproduction of specimina, either on paper, photography or digital supports. Computer terminals are available for accessing the OPAC catalogue. The library is open for the general public everyday. In order to access it is sufficient to show a valid ID and to fill-in a form. Books can be requested for in-library reading; distribution ends at 12.30 on Monday, Wednesday and Firday, and at 16.00 on Tuesday and Thursday.